Yay! Forecast is fun, although you might get sick of bobbles by the end. Or not. I'm still enjying them, although I'm on my third bobble technique, so that might help. I recommend rejigging the pattern so all the garter stitch is knit, unless you're just as fast at purling as knitting. and yarns Jussi, 7 veljestä, Nalle. 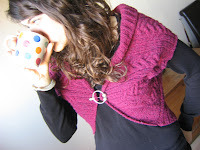 I like Rowanspun - I have a sweater out of it and it is just fine with a tshirt under it....Great yarn for Forecast! I'm super-impressed by your tablecloth! oooh, what a beautiful pattern for that table cloth! i can't wait to see it all blocked. i really like forecast with the winnie mods. it makes for a very wearable garment. 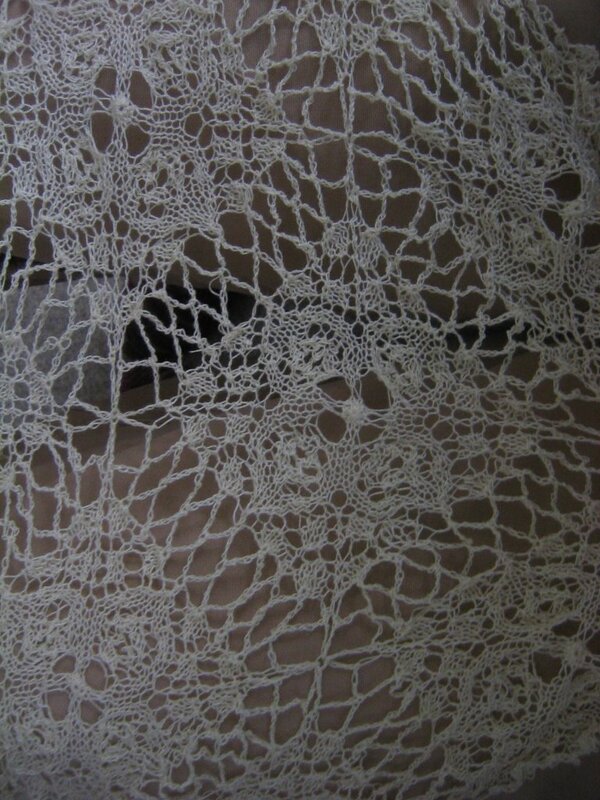 Really beautiful lace. The patience you must have! 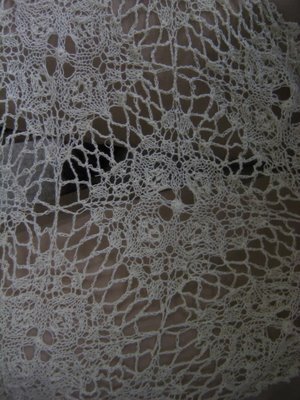 I haven't knitted my Edwardian Lace for ages (and it's nowhere near as fine as yours). I started Forecast on Sunday (actually, you already know that, don't you) and have already divided the sleeves from the body - it's a fast knit, and enjoyable. I saw one version of forecast where it was made about 5-6 inches longer which was really cool. You must have so much patience to make an entire tablecloth out of that lacey pattern. I am loving this tablecloth! The table cloth is beautiful. And it's the essence of knitting, that sort of project. Time consuming and timeless. I am inspired. I have a lame boyfriend-sock question. I've never made a toe-up sock before, but I've just learned the Turkish cast on so I'm excited to make them for my husband! My question is on round 1. It says "Rnd1: kfb, k to st before sm, kfb, kfb, k to last st, kfb." But I don't see any indication of where a stitch marker (sm?) was to be placed. If I'm on 2 circs am I increasing evenly on each side of the toe? In which case I would do kfb, k to 1 st before end of 1st needle, kfb. kfb on first st of 2nd needle, k to last stich on 2nd needle and kfb in that stitch. But maybe because of the cable-ing even-ness isn't desired? In which case you'd end up with one needle that had a lot more stitches on it. hi beanmama - I tried to find an email for you and then to leave a comment on your blog but it is xanga so I couldn't. so i hope you get this.. I used Rowanspun Aran for my Rogue and loved it. It already had a slightly felted quality but a gentle wash in wool soap has left it soft enough to wear against my (reptilian) skin and still with excellent stitch definiton. As for good wool mixes, Cygnet Woolrich Aran is amazing - very soft and cheap. That's going to be beautiful. Perhaps you are somebody I already know! I came across your blog because it contains a passing reference to Sir Roger Penrose, some months ago. Great yarn for Forecast! I really like it. Nice blog. Keep posting such blogs. I'll visit again. Beautiful pattern. I love it. Thanks for posting. Really a great post. I appreciate. Thanks for posting. Wonderful pattern designed. Great work. Keep posting. Such an amazing post. I really wonder.